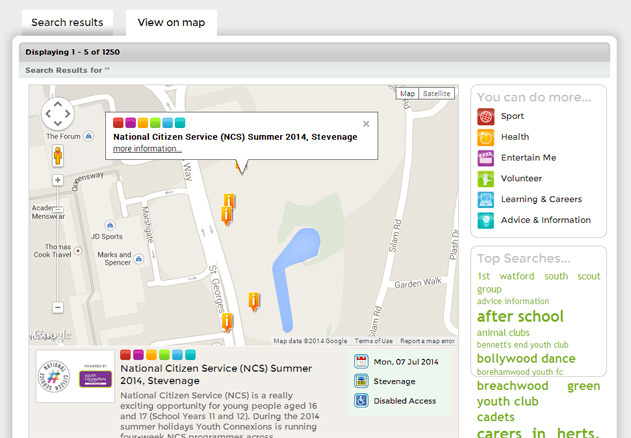 MOGOlistings is here to help young people and their parents and guardians find places within the Hertfordshire region to go and be active. Tell us where you are or what you are looking for, and we’ll point you to some places nearby. All you need to do to get started is to put a place or postcode into the WHERE search box on the home page and then select GO. You can use a postcode, the town name, or a full address, and we’ll show you a list of all the places we know about in Hertfordshire near you where you can go and take part in some sort of youth opportunity. The resulting list is in order of distance, from closest to furthest, and to start with, will include everything. Click through on the name of an Opportunity that looks promising, and we'll tell you what we know about it: which activities take place there, and how to contact people who can tell you more about it. 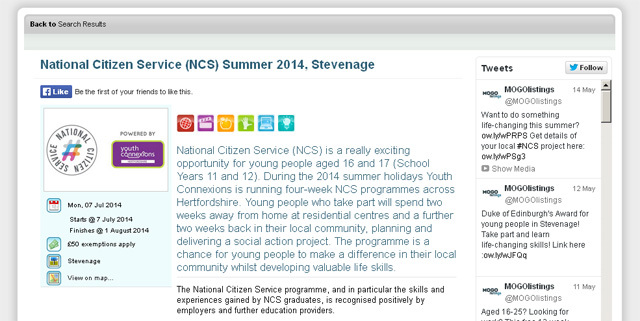 Figure 3: Details page for "National Citizen Service"
Equally, you could enter a term in the WHAT search box (e.g. Music) and then select GO to find opportunities. 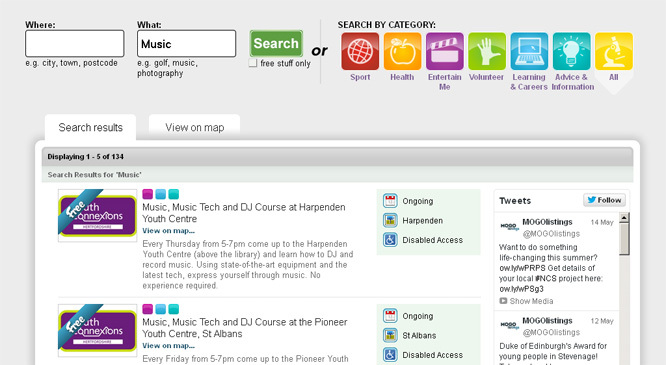 This type of search will find music related Opportunities across Hertfordshire. You can also click through to the map view from the tab in the grey taskbar under the Search boxes. You also select to view an individual Opportunity by slecting View on map … in both the Summary Results and on the Opportunity's details page. Youth Connexions Hertfordshire is committed to producing websites and web resources that can be accessed by all of our visitors. All pages produced on this website conform to the World Wide Web Consortium's (W3C), Web Accessibility Initiative (WAI) and Web Content Accessibility Guidelines Level-A standard as a minimum. We are always keen to hear about ways we can improve the services we provide. 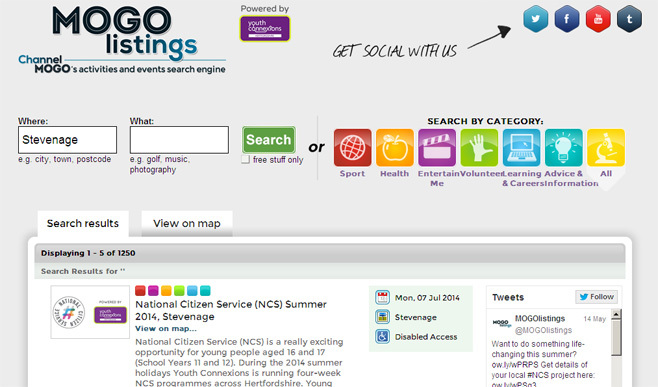 If you are having any difficulties using this website, please contact Youth Connexions Hertfordshire at channelmogo@hertfordshire.gov.uk or ring 01438 843137. In accordance with best practice, this site uses Cascading Style Sheets (CSS) for layout and formatting. If your browser or browsing device does not support stylesheets at all, the content of each page is still readable and usable. All pages on this site comply with all priority 1 guidelines of the W3C Web Content Accessibility Guidelines, and validate as XHTML 1.0 Transitional and as CSS.